This healthier mac and cheese uses pumpkin puree in the sauce, Gruyère and goat cheese to make a rich, creamy dish of comfort food. OK, we already know that we are going to be eating our fair share of cookies and drinking our fair share of cocktails this December. But we still need to eat dinner, and it wouldn’t hurt if that dinner had some healthy qualities. Still, it’s winter, and I don’t know about you, but I am craving comfort food. A few weeks ago I got a serious craving for mac and cheese. It was cold outside and I just wanted to dig in to a huge dish of cheesy, carby goodness. I wanted to make it a little bit healthier though. Now, I’m not telling you that this is diet mac and cheese (ew), or skinny mac and cheese. It still has a fair amount of cheese, and pasta. But the pumpkin not only adds a nice flavor and creaminess, but as a bonus some extra fiber too. I also used evaporated milk instead of cream or half and half. I got the idea from America’s Test Kitchen as a way to make a healthier mac and cheese. If you want to use regular milk here, please note that I have not tested that, but I don’t see why it wouldn’t work (it just may make the sauce thinner, so you will probably need to add less pasta water). I didn’t use a roux in this recipe, so there is no extra flour (aside from what is in the pasta, obviously). I also used whole wheat shells here. I normally really dislike whole wheat pasta, having had some that tasted very much like cardboard in the past. Some bloggers I follow have been raving about the Delallo brand whole wheat pasta, so I decided to give it a try. I was pleasantly surprised because it was actually really good! So if you are looking for a whole wheat pasta, I would recommend trying them out (note, this is NOT sponsored at all, I just like them). My inspiration came from a few places on this recipe. A few years ago, I made THIS squash and mac recipe from Martha Stewart, and I loved it. Recently I was seeing a few variations on the squash mac and cheese idea, like THIS one and THIS one. I wanted to try it with pumpkin because I had a can on hand and it eliminates the whole chopping and cooking of squash, which really cuts down on time. And I went with goat cheese and Gruyère, because HELLO. They are the best. I originally tried it with JUST goat cheese and I thought the sauce was a little dry, which is why I decided to add the Gruyère. If you don’t like Gruyère I think cheddar would work in its place. I also added some magic to the sauce that is known as pasta water. Anytime you make pasta, it is always a good idea to save some of the pasta cooking water when you drain it. Adding it to a lumpy, so so sauce will make it silky smooth. I used about half a cup to get the consistency that I wanted. Now the icing on the cake (or the topping on the mac?) – toasted garlic breadcrumbs. I couldn’t even get that part into the title or else it would be the longest title of any recipe ever. P.S., garlic toasted breadcrumbs may sound time-consuming or difficult BUT IT IS NOT. And it is worth it, trust me. All you need is some panko breadcrumbs, some olive oil and some garlic. You heat the olive oil over medium heat, add the garlic and cook for about 30 seconds – you don’t want to burn it! Then add the breadcrumbs and stir until they start to turn golden brown. That is it! Super easy, and adds a perfect crunch that you don’t want to miss (you can leave the garlic out. If you want. I don’t really know why you would want to though). Then you just cover it tightly with foil and bake for about 15 minutes. Uncover and bake another 5-6 minutes until the top is golden and bubbly. If you don’t cover it at the beginning it will get too brown on top and dry out. Take it out of the oven and you have a big dish of creamy comfort food. Cook pasta until al dente according to package instructions. When draining, save 1 cup of the pasta cooking water and set aside. Toss the hot pasta with a little butter or olive oil if it will not be mixed with the sauce right away, to prevent sticking. In a large saucepan, melt 2 tablespoons of butter over medium heat. Add onions with a pinch of kosher salt. Reduce heat to medium low. Cook until golden, about 15 minutes. Watch carefully as they can burn easily, you may need to reduce heat. Add the pumpkin puree and cook, stirring constantly for 1-2 minutes. Add the evaporated milk and stir until smooth. Add the spices and ½ teaspoon kosher salt. Add the cheeses, stir until fully melted and incorporated, a few more minutes. Add some pasta water until you get the consistency you like. I ended up using about ½ a cup. Remove from heat and pour over pasta, mix until pasta is fully coated in sauce. Pour the pasta into the casserole dish. Meanwhile, heat 1 Tablespoon of olive oil over medium heat. Add the last clove of diced garlic and stir until fragrant, about 30 seconds. Add the breadcrumbs and stir continually until crumbs are turning golden, about 4-5 minutes. Sprinkle breadcrumbs over pasta in an even layer. Cover the whole dish tightly in foil and bake for about 15 minutes. Remove foil and cook for another 5-6 minutes until the top is golden and bubbly. Remove from oven and allow to sit for a few minutes before serving. Are you craving comfort food? What kinds of foods do you like to eat when it gets cold outside? Hello there! I love this recipe and I’ve put it into a roundup post of my favourite pumpkin recipes. I’ve credited all your work, here’s a link: http://maverickbaking.com/10-very-best-pumpkin-recipes/ . Thanks! Thanks Kelly! Just popped over to check it out and share! Thank you so much Adina! I would love to hear if you do make it! This pumpkin mac and cheese looks amazing!! Usually mac and cheese just gets a little monotonous with all that cheese but the pumpkin must really add a lot more flavor! And it just keeps getting better with those toasted breadcrumbs. I definitely want to make this but try it with some dairy alternatives. Thank you so much Linda! The pumpkin definitely adds a different flavor and texture. I bet that you could adapt this to dairy free, I would love to hear about it if you do! Thank you so much for the pins Stephanie! And goat cheese is the best, for sure. I’m all about cheesy, carby goodness this time of year and this pumpkin mac and cheese looks fantastic! Yes to carbs! Thank you Rachel! Everything about this dish is calling my name. Besides the fact that I absolutely love gruyere, squash in mac and cheese always tastes amazing! And does diet mac and cheese actually exist? Grosss! God, I would hope not but I bet it does. Not cool! Thank you Katy, I’m glad you love squash n mac as much as I do! Gah, sorry friend! I am so sorry you can’t have cheese, that is the worst! Well, not being able to eat chocolate would be the actual worst, but cheese is a close second. But I have confidence that you could adapt this into something dairy free and delicious. Thanks lady! Thanks so much Vicky and Ruth! it is a little different than a regular mac and cheese, but we loved it! I am totally into savory pumpkin recipes this year! We have been doing a pumpkin penne and a spicy pumpkin soup, so this mac and cheese is TOTALLY going to happen!! I love the spices you added! Thanks so much Annie! That pumpkin penne sounds great, is it on your blog? Meghan – this looks sooo good. I’d love a big giant plate for lunch please! Love the addition of pumpkin and I’ll take anything with goat cheese. Thanks for the tip about adding pasta water to the sauce – I’ve done that before with a regular pasta but never thought of it for mac and cheese. Thank you Geraldine! The water really helps to loosen up the sauce since it has less cheese than a regular mac and cheese espeically. This mac and cheese recipe sounds incredible! I love how you added both gruyere and goat cheese. This is the perfect fall comfort food! I’m totally digging that ultra creamy sauce — yum! Oh my, I have no words to describe how much I would LOVE to be sitting down to a big bowl of this beautiful pasta. I am bookmarking the recipe because it looks absolutely divine. I love pumpkin but would never have thought to add it to mac and cheese – brilliant! Thanks so much Jess! Sometimes you just need a big bowl of pasta! I love the savory use for pumpkin as much as the sweet. Sounds delicious! 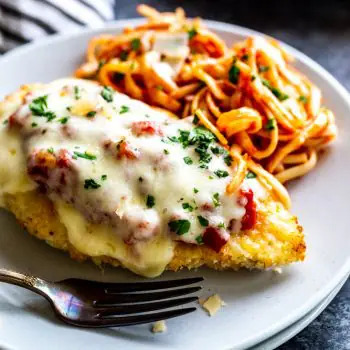 I love the idea of adding the garlic bread crumbs~? Thank you! Someone asked me on instagram if this could be made with all goat cheese – I told them to try half chevre half goat cheddar if possible. Do you think that would work for you if you replace the milk?